Photosynthesis is the conversion of the energy of sunlight into chemical energy by living organisms. In most cases, the raw materials are carbon dioxide and water; the energy source is sunlight; and the end-products are oxygen and (energy rich) carbohydrates, for example sucrose and starch. However, there are some classes of bacteria that utilize a form of photosynthesis that does not produce oxygen (anoxygenic photosynthesis). Photosynthesis is arguably the most important biochemical pathway, since nearly all life depends on it. It is a complex process occurring in higher plants, phytoplankton, algae, and even such bacteria as the cyanobacteria. Photosynthetic organisms are also referred to as photoautotrophs, because they synthesize food directly from inorganic compounds using light energy. In green plants and algae, photosynthesis takes place in specialized cellular compartments called chloroplasts. In photosynthetic bacteria, which lack membrane-bound compartments, the reactions take place directly in the cell. The essential function of photosynthesis in the biosphere attests to the interdependence of life. Although oxygen is, strictly defined, a waste product of photosynthesis reactions, the majority of organisms, including plants, utilize oxygen for cellular respiration. Moreover, heterotrophs, which include animals, fungi, and most bacteria, are unable to synthesize organic compounds from inorganic sources, and must rely on the (direct or indirect) consumption of plants and other autotrophs to obtain the organic substrates necessary for growth and development. The ancestors of many current species are thought to have evolved in response to the oxygen catastrophe, a massive environmental change believed to have occurred about 2.4 billion years ago. At about that time apparently, evolving life forms developed photosynthetic capabilities and began producing molecular oxygen in such large quantities that it eventually caused an ecological crisis because oxygen was toxic to anaerobic organisms, the dominant life form of that period. In addition to being a crisis for anaerobic organisms, the period of the oxygen level explosion opened tremendous opportunity for those forms of life that could exploit the newly abundant gas as a potent source for metabolic energy. Life had remained energetically limited until the widespread availability of oxygen. This breakthrough in metabolic evolution greatly increased the free energy supply to living organisms: today, more than 1017 kcal of free energy is stored annually by photosynthesis on earth, which corresponds to the fixation of more than 1010 tons of carbon into carbohydrates and other organic compounds. In chemical terms, photosynthesis is an example of an oxidation-reduction process. In plants, photosynthesis uses light energy to power the oxidation of water (i.e., the removal of electrons), to produce molecular oxygen, hydrogen ions, and electrons. Most of the hydrogen ions and electrons are then transferred to carbon dioxide, which is reduced (i.e., it gains electrons) to organic products. Specifically, carbon dioxide is reduced to make triose phosphate (G3P), which is generally considered the prime end-product of photosynthesis. It can be used as an immediate food nutrient, or combined and rearranged to form monosaccharide sugars, such as glucose, which can be transported to other cells or packaged for storage as an insoluble polysaccharide such as starch. where (CH2O) refers to the general formula for a carbohydrate. with H2A acting as the electron donor. It may be water or it may be something such as H2S, as in the case of purple sulfur bacteria that yield sulfur as a product rather than oxygen. Note, the source of the oxygen comes from water, not from the carbon dioxide. The reactions of photosynthesis occur in cellular subcompartments called chloroplasts, which themselves are further compartmentalized by inner and outer membranes separated by an intermembrane space. The inner membrane's interior space, called the stroma, is filled with a fluid whose rich supply of enzymes supports light-dependent reactions of photosynthesis occurring inside stacks of membranous flattened sacs (thylakoids). The thylakoid stacks are called grana (singular: granum). Embedded in the thylakoid membrane is the antenna complex comprising proteins and light-absorbing pigments. Although plants absorb light primarily through the pigment chlorophyll, the light absorption function is supplemented by other accessory pigments such as carotenes and xanthophylls. This arrangement both increases the surface area for light capture and allows capture of photons with a wider range of wavelengths. The internal structure of a chloroplast. One of the stacks of thylakoids (called a granum) is circled. Although all cells in the green parts of a plant have chloroplasts, most light energy is captured in the leaves. The cells in the interior tissues of a leaf, called the mesophyll, can contain between 450,000 and 800,000 chloroplasts for every square millimeter of leaf. The surface of the leaf is uniformly coated with a water-resistant waxy cuticle that protects the leaf from excessive evaporation of water and decreases the absorption of ultraviolet or blue light to reduce heating. Algae—which come in multiple forms ranging from multicellular organisms like kelp to microscopic, single-celled organisms—also contain chloroplasts and produce chlorophyll. However, various accessory pigments are also present in some algae, such as phyverdin in green algae and phycoerythrin in red algae, resulting in a wide array of colors. Photosynthetic bacteria do not have chloroplasts (or any membrane-bound compartments). Instead, photosynthesis takes place directly within the cell. Cyanobacteria contain thylakoid membranes very similar to those in chloroplasts and are the only prokaryotes that perform oxygen-generating photosynthesis. Other photosynthetic bacteria contain a variety of different pigments, called bacteriochlorophylls, and do not produce oxygen. Some bacteria, such as Chromatium, oxidize hydrogen sulfide instead of water, producing sulfur as a waste product. 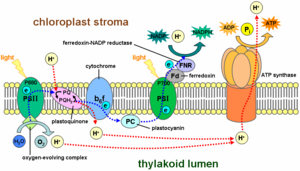 The light-dependent reactions of photosynthesis occur at the thylakoid membrane. Photosynthesis begins when light is absorbed by chlorophyll and accessory pigments. Not all wavelengths of light can support photosynthesis. 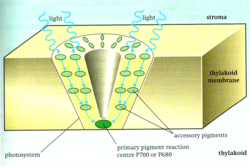 The photosynthetic action spectrum depends on the type of accessory pigments present. For example, in green plants, the chlorophylls and carotenoids absorb all visible light other than green, with peaks for violet-blue and red light. In red algae, the action spectrum overlaps with the absorption spectrum of phycobilins for blue-green light, which allows these algae to grow in deeper waters that filter out the longer wavelengths used by green plants. The non-absorbed part of the light spectrum is what gives photosynthetic organisms their color (e.g., green plants, red algae, purple bacteria) and is the least effective wavelength for photosynthesis in the respective organisms. 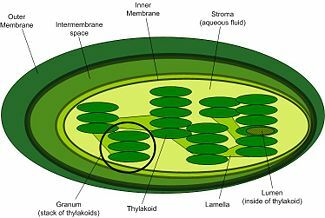 A light-harvesting cluster of photosynthetic pigments (called a photosystem) is present in the thylakoid membrane of chloroplasts. Photosystem I generates reducing power in the form of NADPH (a process called photoreduction). Photosystem II transfers the electrons of water to a quinone (a type of aromatic compound) at the same time that it forms oxygen from the oxidation of water. NADPH is the main reducing agent in chloroplasts, providing a source of energetic electrons to other reactions. However, its production leaves chlorophyll with a deficit of electrons, which must be obtained from some other reducing agent. The source of these electrons in green-plant and cyanobacterial photosynthesis is water. Electron flow within and between each photosystem generates a transmembrane proton gradient that drives the synthesis of ATP, through a process known as photophosphorylation. When a chlorophyll molecule at the core of the photosystem II reaction center obtains sufficient excitation energy from the adjacent antenna pigments, an electron is transferred to the primary electron-acceptor molecule through a process called photoinduced charge separation. These electrons are shuttled through an electron transport chain, the Z-scheme shown in the diagram, that initially functions to generate a chemiosmotic potential across the membrane. An ATP synthase enzyme uses the chemiosmotic potential to make ATP, while NADPH is a product of the terminal redox reaction. The Z-scheme is an electron transport chain that generates the chemioosmotic potential used to synthesize ATP. It is so-called because the redox diagram takes the shape of a Z. The pathway described above is referred to as non-cyclic photophosphorylation. However, an alternative pathway is cyclic photophosphorylation, in which ATP is generated without the concomitant formation of NADPH. This pathway is utilized when NAD+ is unavailable to accept electrons. The cyclic reaction takes place only at photosystem I. Once the electron is displaced, it is passed down the electron acceptor molecules and returns to photosystem I.
Overview of the Calvin cycle and carbon fixation. Plants use chemical energy generated from ATP and NADPH to fix carbon dioxide (a process also known as carbon reduction) into carbohydrates and other organic compounds through light-independent reactions (or the Calvin cycle). They reduce carbon dioxide and convert it into 3-phosphoglycerate in a series of reactions that occur in the stroma (the fluid-filled interior) of the chloroplast. Hexoses (six-carbon sugars) such as glucose are then formed from 3-phosphoglycerate by the gluconeogenic pathway. Specifically, the fixation of carbon dioxide is a light-independent process in which carbon dioxide combines with a five-carbon sugar, ribulose 1,5-bisphosphate (RuBP), to form a six-carbon compound. This compound is hydrolyzed to two molecules of a three-carbon compound, glycerate 3-phosphate (GP), also known as 3-phosphoglycerate (PGA). In the presence of ATP and NADPH from the light-dependent stages, GP is reduced to glyceraldehyde 3-phosphate (G3P). This product is also referred to as 3-phosphoglyceraldehyde (PGAL) or even as triose phosphate (where triose refers to a 3-carbon sugar). This reaction is catalyzed by an enzyme commonly called rubisco (after ribulose 1,5-bisphosphate carboxylase/oxygenase), located on the stromal surface of the thylakoid membrane. Rubisco is the most abundant enzyme, and probably the most abundant protein, in the biosphere, accounting for more than sixteen percent of the total protein of chloroplasts. Five out of six molecules of the G3P produced are used to regenerate the enzyme RuBP, so that the process can continue. One out of six molecules of the triose phosphates not "recycled" often condenses to form hexose phosphate, which ultimately yields sucrose, starch and cellulose. The sugars produced during carbon metabolism yield carbon skeletons that can be used for other metabolic reactions like the production of amino acids and lipids. Three molecules of ATP and 2 molecules of NADPH are consumed in converting carbon dioxide into a one molecule of a hexose such as glucose or fructose. Overview of C4 carbon fixation. In hot and dry conditions, plants will close their stomata (small openings on the underside of leaves used for gas exchange) to prevent loss of water. Under these conditions, oxygen gas, produced by the light reactions of photosynthesis, will concentrate in the leaves, causing photorespiration to occur. Photorespiration is a wasteful reaction: organic carbon is converted into carbon dioxide without the production of ATP, NADPH, or another energy-rich metabolite. Rubisco, the enzyme that captures carbon dioxide in the light-independent reactions, has a binding affinity for both carbon dioxide and oxygen. 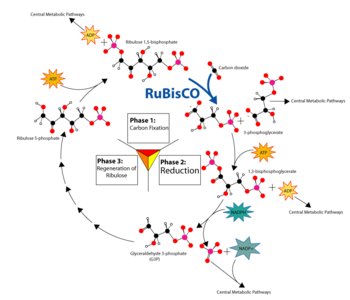 When the concentration of carbon dioxide is high, rubisco will fix carbon dioxide. However, if the oxygen concentration is high, rubisco will bind oxygen instead of carbon dioxide. Rubisco’s tendency to catalyze this oxygenase activity increases more rapidly with temperature than its carboxylase activity. The solution arrived at by the C4 plants (which include many important crop plants such as maize, sorghum, sugarcane, and millet) is to achieve a high concentration of carbon dioxide in the leaves (the site of the Calvin cycle) under these conditions. 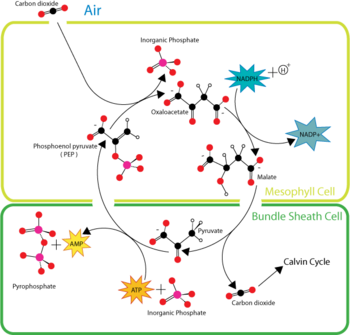 C4 plants capture carbon dioxide using an enzyme called PEP carboxylase that adds carbon dioxide to the 3-carbon molecule phosphoenolpyruvate (PEP), creating the 4-carbon molecule oxaloacetic acid. Plants without this enzyme are called C3 plants because the primary carboxylation reaction produces the 3-carbon sugar 3-phosphoglycerate directly in the Calvin cycle. When oxygen levels rise in the leaf, C4 plants plants reverse the reaction to release carbon dioxide, thus preventing photorespiration. Through this mechanism, C4 plants can produce more sugar than C3 plants in conditions of strong light and high temperature. These C4 plants compounds carry carbon dioxide from mesophyll cells, which are in contact with air, to bundle-sheath cells, which are major sites of photosynthesis. The pineapple is an example of a CAM plant. Plants living in arid conditions, such as cacti and most succulents, can also use PEP carboxylase to capture carbon dioxide in a process called Crassulacean acid metabolism (CAM). CAM plants close their stomata during the day in order to conserve water by preventing evapotranspiration. Their stomata then open during the cooler and more humid nighttime hours, allowing uptake of carbon dioxide for use in carbon fixation. By thus reducing evapotranspiration rates during gas exchange, CAM allows plants to grow in environments that would otherwise be far too dry for plant growth or, at best, would subject them to severe drought stress. Although they resemble C4 plants in some respects, CAM plants store the CO2 in different molecules and have a different leaf anatomy than C4 plants. In sum, C4 plants metabolism physically separates CO2 fixation from the Calvin cycle, while CAM metabolism temporally separates CO2 fixation from the Calvin cycle. The concept that oxygen production is not always associated with the fixation of carbon dioxide was first proposed by Cornelis Van Niel in the 1930s. Aside from the cyanobacteria, photosynthetic bacteria have only one photosystem and use reducing agents other than water. They obtain electrons from a variety of different inorganic chemicals including sulfide or hydrogen; thus, for most of these bacteria oxygen is not a by-product of photosynthesis. In photosynthesis, transfer of solar energy to reaction centers takes place almost instantaneously, so little energy is wasted as heat. This chemical energy production is more than 90 percent efficient, with only 5-8 percent of the energy transferred thermally. In contrast, commercial solar panels use less than 30 percent of the light energy that strikes them (Castelvecchi, 2007). A study led by researchers with the U.S. Department of Energy’s Lawrence Berkeley National Laboratory (Berkeley Lab) and the University of California at Berkeley suggests that long-lived wavelike electronic quantum coherence plays an important part in this instantaneous transfer of energy. It allows the photosynthetic system to try each potential energy pathway simultaneously and choose the most efficient option (Berkeley Lab, 2007). As carbon dioxide concentrations rise, the rate at which sugars are made by the light-independent reactions increases until limited by other factors. Another limiting factor is the wavelength of light. Cyanobacteria, which reside several meters underwater, cannot receive the wavelengths involved in photoinduced charge separation using conventional photosynthetic pigments. To combat this problem, a series of proteins with different pigments surround the reaction center. The ability to convert light energy to chemical energy confers a significant evolutionary advantage to living organisms. Early photosynthetic systems, such as those used by various photosynthetic bacteria, are thought to have been anoxygenic, i.e., they used various molecules other than oxygen, such as hydrogen and sulfur, as electron donors. The oxygen in the atmosphere today exists due to the evolution of oxygenic photosynthesis, a process whose period of initial proliferation on the planet is sometimes referred to as the oxygen catastrophe. Geological evidence suggests that oxygenic photosynthesis, such as that in cyanobacteria and later in green plants, became important during the Paleoproterozoic era around two billion years ago. Chloroplasts are now considered to have evolved from an endosymbiotic bacterium, which was also an ancestor of and later gave rise to cyanobacterium. Chloroplasts have many similarities with photosynthetic bacteria, including a circular chromosome, prokaryotic-type ribosomes, and similar proteins in the photosynthetic reaction center. The endosymbiotic theory suggests that photosynthetic bacteria were acquired (by endocytosis or fusion) by early eukaryotic cells to form the first plant cells. In other words, chloroplasts may simply be primitive photosynthetic bacteria adapted to life inside plant cells, while plants themselves have not actually evolved photosynthetic processes on their own. Although some of the steps in photosynthesis are still not completely understood, the overall photosynthetic equation has been known since the late 18th century. In the mid-1600s, Jan van Helmont laid the foundations of research on photosynthesis when he carefully measured the mass of the soil used by a plant and the mass of the plant as it grew. After noticing that the soil mass changed very little, he hypothesized that the mass of the growing plant must come from water, the only substance he added to the potted plant. His hypothesis was partially accurate: much of the gain in mass comes from carbon dioxide as well as water. However, van Helmont made the important discovery that the bulk of a plant's biomass comes from the inputs of photosynthesis, not from the soil itself. 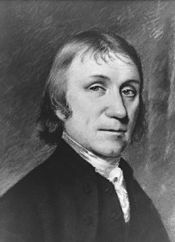 In the 18th century, Joseph Priestley, a chemist and minister, discovered that oxygen is produced during photosynthesis. In a famous experiment, he isolated a volume of air under an inverted glass jar and burned a candle in it. The candle would burn out very quickly, long before it ran out of wax. When he placed a sprig of mint in the jar in a vessel of water, he found that several days later, the air would not extinguish the candle and wasn’t harmful to a mouse put into the vessel. In 1796, Jean Senebier, a Swiss pastor, botanist, and naturalist, demonstrated that green plants consume carbon dioxide and release oxygen under the influence of light. Soon afterward, Nicolas-Théodore de Saussure showed that the increase in mass of a growing plant could not be due only to uptake of CO2, but must also involve the incorporation of water. Thus, the basic reaction of photosynthesis was outlined. Modern scientists built on this foundational knowledge. In the 1930s, Cornelis Van Niel was the first scientist to demonstrate that photosynthesis is a light-dependent redox (reduction-oxidation) reaction, in which hydrogen reduces carbon dioxide. He noticed the common pattern of photosynthesis in green plants and sulfur bacteria, in which sulfur plays an analogous role to oxygen in green plants. Melvin Calvin, along with Andrew Benson and James Bassham, discovered the path of carbon fixation in plants. where A is the electron acceptor. His work confirmed that oxygen comes from water rather than carbon dioxide, and that a primary event in photosynthesis is the light-driven transfer of an electron from one substance to another in a thermodynamically unfavorable direction. 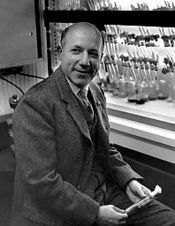 Samuel Ruben and Martin Kamen used radioactive isotopes to confirm that the oxygen liberated in photosynthesis came from water. Melvin Calvin and Andrew Benson, along with James Bassham, elucidated the path of carbon fixation in plants. The carbon reduction cycle is known as the Calvin cycle, which ignores the contribution of Bassham and Benson. Many scientists refer to the cycle as the Calvin-Benson Cycle, Benson-Calvin, and some even call it the Calvin-Benson-Bassham (or CBB) Cycle. A Nobel Prize-winning scientist, Rudolph A. Marcus, was able to discover the function and significance of the electron transport chain in the light-dependent reactions of photosynthesis. Blankenship, R.E. 2002. Molecular Mechanisms of Photosynthesis. Oxford, UK: Blackwell Science. ISBN 0632043210. Brown, T.L., H. E. LeMay, B. E. Bursten, and J.R. Burdge. 2002. Chemistry: The Central Science, 9th ed. Upper Saddle River, NJ: Prentice Hall. ISBN 0130484504. Campbell, N., and J. Reece. 2005. Biology, 7th ed. San Francisco: Benjamin Cummings. ISBN 0805371710. Castelvecchi, D. 2007. 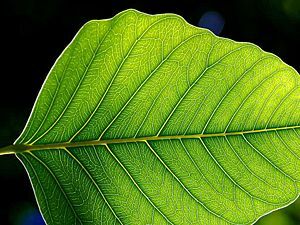 Quantum capture: Photosynthesis tries many paths at once. Science News 171: 229.
Cooper, G. M., and R. E. Hausman. 2004. The Cell: A Molecular Approach, 3rd edition. Washington, D.C.: ASM Press & Sunderland, M.A. : Sinauer Associates. ISBN 0878932143. Gregory, R. P. F. 1971. Biochemistry of Photosynthesis. Belfast: Universities Press. ISBN 0471326755. Govindjee, B. J. T. 1975. Bioenergetics of Photosynthesis. New York: Academic Press. ISBN 0122943503. Govindjee, B. J. T., H. Gest, and J. F. Allen. Eds. 2005. Discoveries in Photosynthesis. Advances in Photosynthesis and Respiration, Volume 20. New York: Springer. ISBN 9781402033230. Lawrence Berkeley National Lab. 2007. 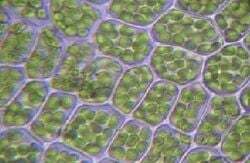 Quantum secrets of photosynthesis revealed. Physorg.com. Retrieved April 13, 2007. Rabinowitch, E. and B. J. T. Govindjee. 1969. Photosynthesis. New York: John Wiley & Sons. ISBN 0471704237. Raven, P. H., R. F. Evert, and S. E. Eichhorn. 2005. Biology of Plants, 7th ed. New York: W.H. Freeman. ISBN 0716710072. Stern, K. R., S. Jansky, and J. E. Bidlack. 2003. Introductory Plant Biology. New York: McGraw Hill. ISBN 0072909412.